Timber trespass and theft can occur on any forest, at any time. Timber trespass, the unauthorized removal of trees, may occur unintentionally where property boundaries are unmarked, unmaintained, or remote. The outright, intentional theft of timber can be devastating to owners, their resources, and profitability. Although laws are in place to punish timber thieves and trespassers, tree harvests may often go undetected for months –making prosecution and restitution difficult. This publication defines timber trespass and theft; lists preventive measures for landowners, pertinent North Carolina Law, and steps to assess lost timber value and seek legal recourse. Timber trespass and theft are fairly infrequent in North Carolina. The intent of this publication is to ensure that you have taken all the necessary steps to avoid becoming a victim or theft or trespass. It may be nearly impossible to imagine the forest that you’ve nurtured could be harvested without your permission and/or in your absence. Preventive steps can help ensure your property against trespass. If theft ocurs you''ll need assistance and a plan for going forth. Closely monitor neighboring logging operations. Risk of theft or trespass is at its greatest when adjoining landowners are harvesting their property. Learn or establish the name of the contractor harvesting the timber in case an issue arises. Alert neighbors of harvesting operation on your property in hopes that they will inform you when they have harvests planned. Good communication reduces theft and makes for good neighbors. Work with reputable foresters when selling or harvesting timber. Professional foresters can plan and sell timber following best practices that ensure future productivity. Their work involves an estimate of worth, clearly marking the area for harvest and regular inspection of logging activity and close-out. Professional oversight ensures that harvest is confined to the sale boundary, complies with water-quality laws, and protects physical structures such as roads and fences. Stay informed of changes or proposals to change the current North Carolina laws that protect landowners against timber thieves. The North Carolina Forest Service, NC State University Department of Forestry and Environmental Sciences, N.C. Cooperative Extension, consulting foresters, and groups such as the Society of American Foresters (SAF), NC Woodlands, and the North Carolina Forestry Association (NCFA) are all reputable sources of information on possible changes in the laws. Participate where you can to strengthen landowner legal protections. Distinguish between: Timber theft is when someone intentionally steals trees from an owner, while timber trespass is when a logger cuts down an adjacent landowner’s trees. § 14‑128. Injury to trees, crops, lands, etc., of another. § 14‑131. Trespass on land under option by the federal government. On lands under option which have formally or informally been offered to and accepted by either the North Carolina Department of Environment and Natural and Cultural Resources or the Department of Environmental Quality by the acquiring federal agency and tentatively accepted by said a Department for administration as State forests, State parks, State game refuges or for other public purposes, it shall be unlawful to cut, dig, break, injure or remove any timber, lumber, firewood, trees, shrubs or other plants; or any fence, house, barn or other structure; or to pursue, trap, hunt or kill any bird or other wild animals or take fish from streams or lakes within the boundaries of such areas without the written consent of the local official of the United States having charge of the acquisition of such lands. Any person, firm or corporation convicted of the violation of this section shall be guilty of a Class 3 misdemeanor. The Department of Environment and Natural Resources Environmental Quality through its legally appointed forestry, fish and game wardens is hereby authorized and empowered to assist the county law‑enforcement officers in the enforcement of this section." § 14‑135. Cutting, injuring, or removing another’s timber. § 1‑539.1. Damages for unlawful cutting, removal or burning of timber; misrepresentation of property lines. (a) Any person, firm or corporation not being the bona fide owner thereof or agent of the owner who shall without the consent and permission of the bona fide owner enter upon the land of another and injure, cut or remove any valuable wood, timber, shrub or tree therefrom, shall be liable to the owner of said land for double the value of such wood, timber, shrubs or trees so injured, cut or removed. (b) If any person, firm or corporation shall willfully and intentionally set on fire, or cause to be set on fire, in any manner whatever, any valuable wood, timber or trees on the lands of another, such person, firm or corporation shall be liable to the owner of said lands for double the value of such wood, timber or trees damaged or destroyed thereby. Most cases of timber harvest (without permission of its owner) wind up in civil court because intent can be difficult to prove. Landowners who didn't have their property lines clearly marked can find it hard to prove someone intended to take the trees. Make sure there are no disputes regarding the location of boundary lines, past or present, through research at your local Register of Deeds office as well as your adjacent landowners. In most cases where a timber theft or overcutting a line has transpired it is best to employ a forester to document the extent of the cutting . This is typically done with a detailed "stump cruise" whereby a measurement of each stump is made including species and a volume estimate of the removed tree is made. There is software available to aid in stump cruising, including a free version available from the US Department of Agriculture, U.S. Forest Service entitled Timber Theft Program. The software helps categorize cut trees by species and size and a regression equation helps determine volumes removed. Alternatives to this method involve a correlation of stump size to diameter at breast height to accurately assess the volume of similar species in the general area of the theft. Removed trees are tallied and volume and value estimate are made from the collected data. Having a stump cruise performed by a registered forester is key to having a fair, defensible calculation of the loss that is evidence-based. While double compensation for removed trees is possible, it is impossible to replace the mature trees that have been cut illegally. However, the law can help enforce the illegal cutting of trees by a third party and provide compensation for property owners whose trees have been removed. Frequent maintenance of property lines, vigilance and monitoring of activities on adjacent lands can decrease the likelihood of loss. Careful documentation and swift reporting increases the probability of just compensation once a timber trespass has occurred. Baker, S., Mortimer, M. and J. Gagnon. 2010. Dealing with timber theft. Virginia Cooperative Extension Service Pub 420-136. Hepler, D.A. and J. Aginsky. 2008. Timber Trespass in a Nutshell: Understanding, Preventing, and Obtaining Compensation for Wrongful Tree Cutting. Page, J.R. and J. Turnage. 2010. Timber trespass legislation in North Carolina. In NCWoodland Review Summer, Vol 5 No2. Routine maintenance of forest property boundaries is good practice. 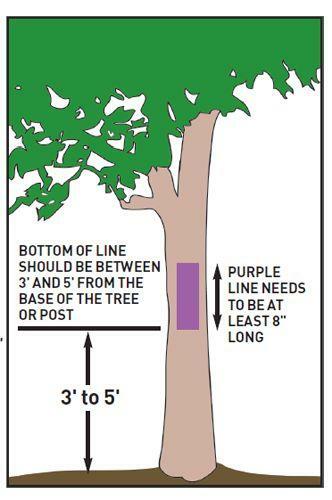 Correct placement of posting (purple blaze) of property to comply with the NC Landowner Protection Act. Posting with purple paint allows law officers to enforce trespass. Note: users will require a permission slip to legally be present. Proper corner marking of forest property boundaries.